We are often asked how we set up for events. The answer is that it depends on the venue. We have a few different set ups depending on the type of event we are doing. For festivals, we like to use our large roll up poster. This is for a number of reasons. The main reason is that the colorful designs and large scale, always draw a crowd to our festival tent. The roll up also shows off the range of tattoo stencil options we can provide, so we can "show off" for potential new clients. We organize our tattoo stencils in two CD storage cases. A line manager helps the clients decide on a glitter tattoo design, takes their money and hands over the chosen stencil and an alcohol prep pad. That way, when the client gets to our chair, there is never a question as to who has paid and who hasn't. The roll up poster is especially designed so that the glitter tattoos that will appeal to the smaller set is right at eye level. 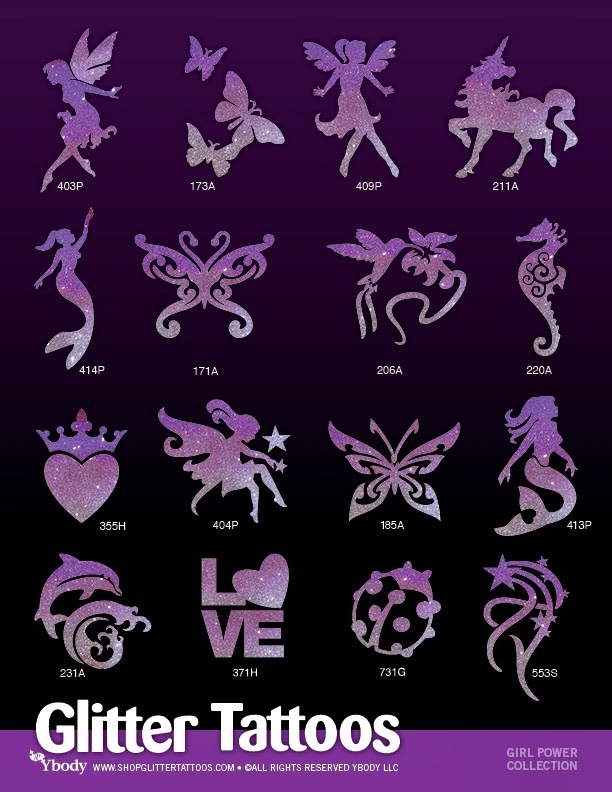 The rest of the designs are grouped by subject and it is really does serve dual purposes, both advertising great glitter tattoos and a great organizing tool. For small parties, I use small jewelry trays and I will bring a small variety of glitter tattoos depending on the age of the party guests. For younger guests I only bring a few choices, and for older kids I bring more. I always bring tattoo stencils like flowers, or tribal designs as well, because the adults almost always want to get in on the fun too! Our stencil sets are always a great choice for parties as well. The poster is a great professional way to display your glitter tattoo choices and keeps little fingers off your tattoo stencils. How do you set up for your events? Let us know at ybodyusa@gmail.com, we'd love to hear!